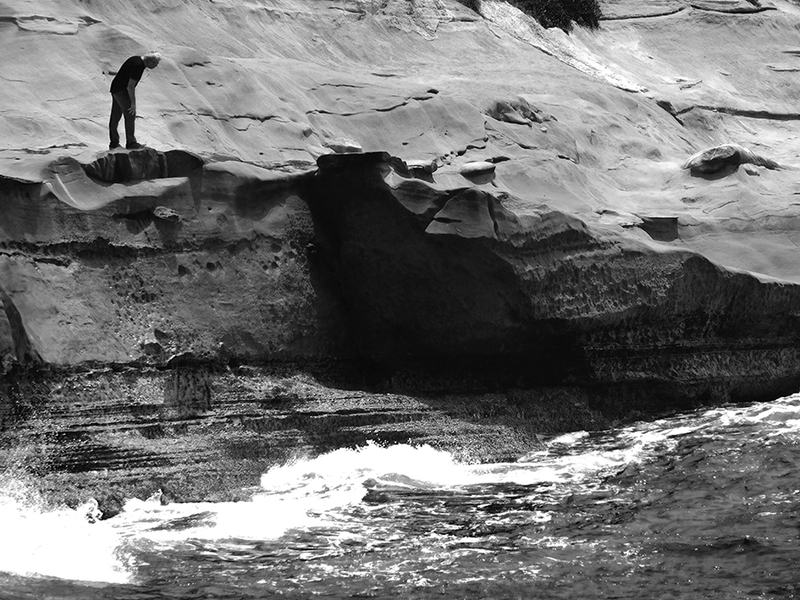 Yesterday, I went to La Jolla Cove hoping that the gray overcast would break and I could finally shoot something. It did finally break at noon, but the light was a bit harsh. Out of a bunch of shots, these two were the only ones I liked. These are cropped images from larger shots, so they are a bit grainy. But the compositions are much better than the originals. For instance, the man on the cliff was standing with a lot of other people to the left of him, but standing alone, he makes this composition work. 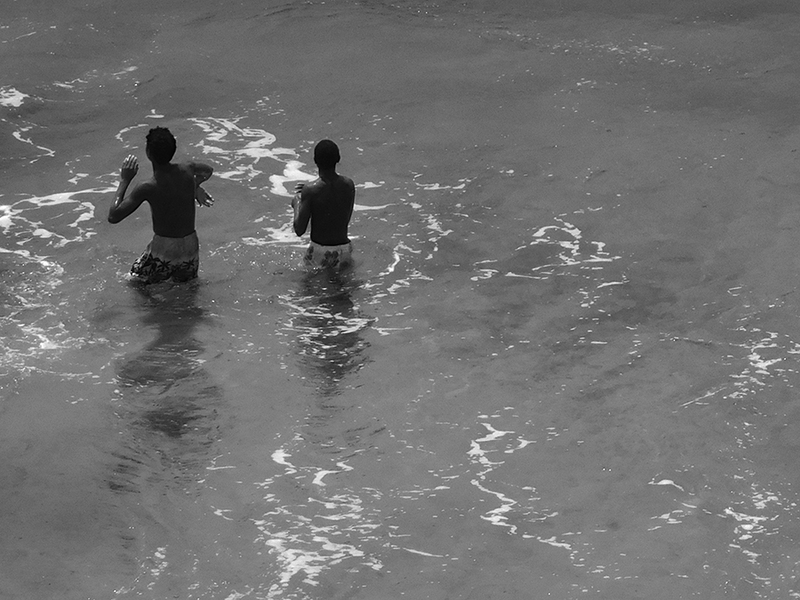 And the picture with the two boys actually had three boys, but the composition didn’t work with how the third boy was positioned, so I cropped him out. With the June Gloom creeping into July, there isn’t much sunlight around. So I’m thinking about playing with indoor photography, photographic collages, or photo composites. Maybe I ‘ll have better results. Stay tuned. I’m always aware of the many species of birds that fly around and travel through Southern California. In this photo are pelicans and cormorants resting in La Jolla Cove. La Jolla Cove is a major tourist attraction in the well-to-do town of La Jolla (pronounced “la hoya”, and it means “the jewel” in Spanish). It gets very crowded, even during the off-season. But everyone must visit the natural beauty of this intimate cove. 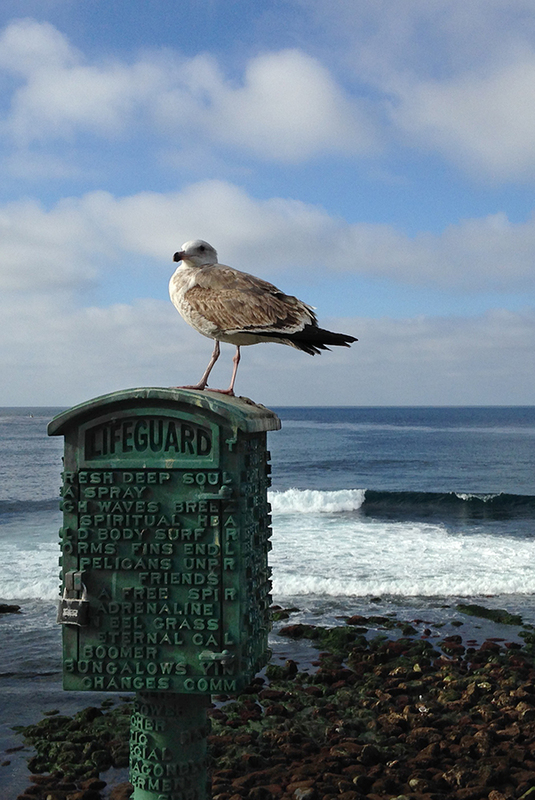 There are sea lions sunning, athletes swimming, tourists snorkeling, kelp beds swaying, and seabirds preening. It’s very easy to get good photos. Visitors can walk along the adjacent sidewalks and get great views. I like the tidepools here, although they are not as populated with animal life as they used to be. But if you are lucky, you can get a glimpse of small lobster, baby octopi, and rock shrimp. Spending time on art and creativity in the second half of my life.